Thank you for joining me as we explore Prayer A-Z in 2019. 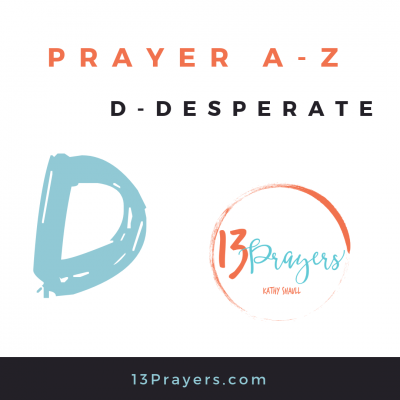 This week we focus on Desperate Prayer. Considering that there are several examples of desperate prayers in various situations in scripture, as well as a myriad of verses that tell us how to pray in desperate times, we should be comforted in knowing God expects us to pray in when we are desperate. For Direction-Sometimes we pray a desperate prayer for direction and can't see the answer right in front of us. "Trust in the Lord with all your heart and lean not on your own understanding; in all your ways acknowledge Him, and He will make your paths straight." (Prov. 3:5-6) Trust fully. Don't try to work it out on your own. Give Him credit, and He'll open your eyes to the path. For Healing-Haven't we all prayed at least one desperate prayer for God to heal either ourselves or someone we care for? Psalm 107:19-20 says, "Then they cried to the Lord in their trouble; and He saved them from their distress. He sent forth His word and healed them; He rescued them from the grave." For Victory in Spiritual Battles-First, you have to remember that God is always with you. "Be strong and courageous, do not be afraid or terrified because of them, for the Lord your God goes with you; He will never leave you or forsake you." (Deut. 31:6) Great promise, right? Also, "no weapon forged against you will prevail, and you will refute every tongue that accuses you. This is the heritage of the servants of the Lord, and this is their vindication from me," declares the Lord. (Is. 54:17) So? Pray these verses and claim them! For Rescue in Trouble-Ever feel like you fell into a giant, slimy pit of trouble and you've been there forever? Desperate times, indeed. "I waited patiently for the Lord; He turned to me and heard my cry. And He lifted me out of the slimy pit, out of the mud and mire; he set my feet on a rock and gave me a firm place to stand. He put a new song in my mouth, a hymn of praise to our God. Many will see and fear and put their trust in the Lord." (Ps. 40:1-3) Notice: Waiting patiently - though hard while desperate, and a new position and song that lead others to know Him. This rescue becomes ministry! For Financial Help-Jesus' ministry offers many examples of God's provision when money is short. In Mark 6:30-44, He and the disciples feed thousands with only five loaves of bread and two fish. And each of the twelve had a basket, full of leftovers. They had no money for food, and Jesus took what little they did have, prayed over it, and it multiplied to abundance. Do these cover all types of desperate prayer? No. The most basic prayer of desperation is to simply whisper His name, "Jesus." Will He know your situation? Yes. Will He see your need? Yes. **Don't forget, it helps to ask another believer to pray with you. Connect with me on my Facebook page or Instagram and let me know how I can lift you up, specifically. Father God, we come to You in our time of most desperate need. For healing. Financial blessings. For direction. And rescue in worldly trouble and against spiritual enemies. We ask for Your miraculous power to change our situation in such a way that the world will know it HAS TO BE from YOU. Thanks for stopping by. All Prayer A-Z posts are linked here.